Mark and Jackie have supported many organisations, groups, clubs and individuals in the greater Ōtaki area to fundraise by making their premises available, or by giving them vast amounts of their products to fundraise with. That fundraising has ensured many organisations such as the Surf Club, Rotary club, Police, Maori Women’s Welfare League, Red Cross Collection and Foodbank to continue to provide services in the community. There are many events in Ōtaki where food platters have also been provided by the pair. Community Constable Moore says he has had a number of dealings with Mark and Jackie during his time in Ōtaki and has always found them willing to help the community in whatever way they can, particularly youth. Recently he ran a program out of Ōtaki College called CACTUS which is based along military lines. He approached Mark and Jackie about early-morning breakfasts for 24 students, three times a week for eight weeks. They were more than willing to oblige and donated a significant number of food items, allowing the budget for the course to be spent on other items. Constable Moore also mentions the couple have donated much of their time and business to helping other community projects which go largely unrecognised. Otaki also celebrates Shelly Warwick as the epitome of ‘being of service’ to the community. She is always at the forefront of organising fundraising events and puts everything into making them successful. Chairing meetings, chasing down items on to-do lists, negotiating with Council and NZTA, coaching sports teams, looking after other people’s children – Shelly does it all in her ‘anything’s possible, high- energy’ way. Shelly was born & bred in Ōtaki. After her schooling there, she headed off to do nursing training followed by her big OE. After a few years in Australia, she returned to her home town 15 years ago and has been heavily involved in many parts of the community since. She is a key driver in making sports, activities and facilities available for a broad cross-section of people. She was also the driving force for the Ōtaki Kids Safe Crossing Group, which has provided the community with a safe option for crossing the increasingly busy highway. Along with the new speed indication device signs encouraging traffic to slow down in this 50km area, the group has opened up safer opportunities for children and families to travel to and from Waitohu School and Ōtaki College without the need of a car. Shelly is also involved in the Otaki Athletics, Soccer and Surf Lifesaving clubs. 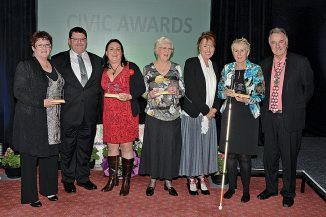 The Ōtaki Promotions Group were runners-up for their Kite Festival in the Community Awards Sports and Leisure category. The Ōtaki Mail joins in the accolades and congratulates all worthy award winners.